An initial review and granting of transfer credits will be completed by the Office of Admissions at the point of acceptance to all degree programs, and accepted students will be notified of their transferable credits in their acceptance packet for both Associate in Science and Bachelor of Science programs. 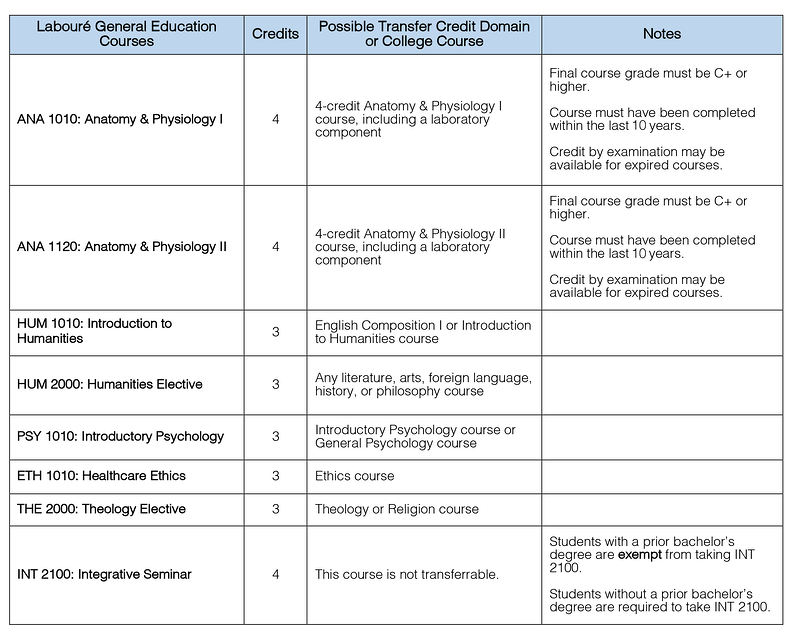 Courses considered for transfer credit must be equivalent to those offered at Labouré College in terms of nature, content, level, and number of credits earned. Transfer credits are granted at the discretion of the Department Chairperson and Vice President of Academic Affairs. Transfer credit is only available for courses in the General Education core of the program. 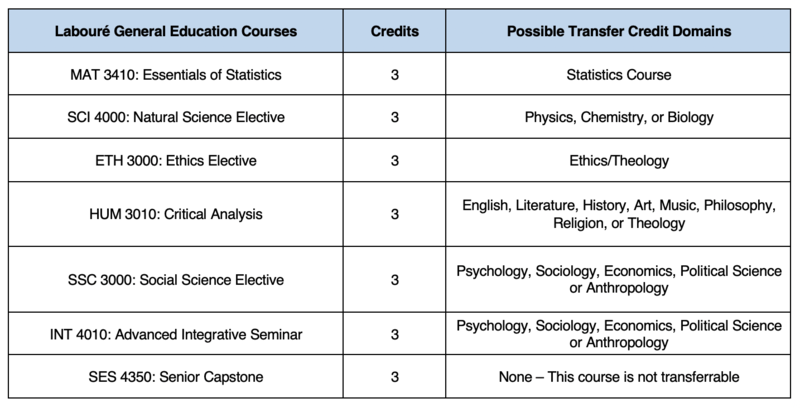 Transfer credits are awarded only for courses completed at accredited institutions; courses must be taken at the college level, and have a final grade of C or higher unless otherwise noted below. Transfer credit is subject to approval by the Department Chairperson. *Courses that require a time frame within 10 years are considered within 10 years to the semester of acceptance. If your course was taken more than 10 years ago, you may be eligible for Credit by Examination via a challenge exam. Please contact Admissions for details. All students must complete a total of 21 general education credits beyond the associate degree level. Students may transfer courses from other accredited academic institutions to meet some of these requirements. Statistics: One 3-credit course at any level either with a grade of C or higher. If taken as part of an associate’s degree program, MAT 3410 is waived and the student may take an elective instead. If the course was not counted toward an associate’s degree, then it may be transferred for credit toward the BSN degree. Ethics: One 3-credit course at any level either with a grade of C or higher. If taken as part of an associate’s degree program, ETH 3210 is waived and the student may take an elective instead. If the course was not counted toward an associate’s degree, then it may be transferred for credit toward the BSN degree. Distribution Requirements: Up to 12 credits in the humanities, social sciences and natural sciences beyond the associate’s degree. Students must have at least one course in each of the three domains. 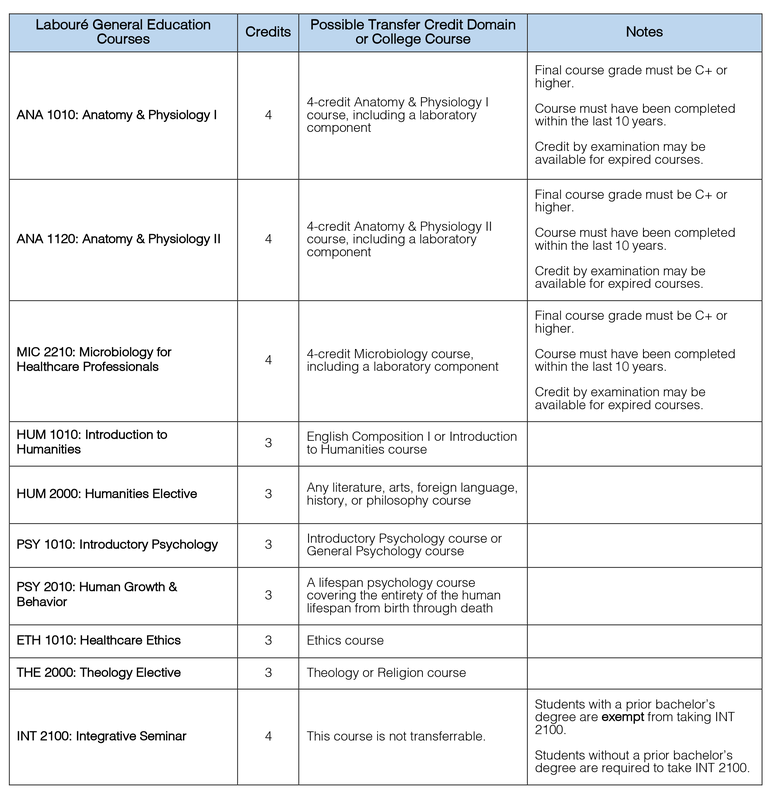 Six credits may be transferred from the introductory level, but at least 6 credits must be at a level equivalent to or higher than a 2000-level Labouré course. Capstone: The Senior Capstone project in non-transferable. It must be completed in residence. Students who do not hold other baccalaureate degrees may fulfill up to 15 of the 21 required general education credits through the transfer process. They must, however, meet the statistics and ethics requirements (either in residence or through transfer credit) and complete at least one 3-credit course and their Senior Capstone project in residence. Students who hold other baccalaureate degrees may fulfill up to 18 of the 21 required general education credits through the transfer process. However, they must meet the statistics and ethics requirements (either in residence or through transfer credit) and complete their Senior Capstone project in residence. Professional core courses are reviewed at the discretion of the BSN Program Director. For questions regarding transfer of Professional course credits, please contact the Office of Admissions. For a review of transfer credit categories requiring the approval of a Chairperson, the accepted student must submit a Transcript Review Request to the Office of Admissions. The Transcript Review Request form must be completed and accompanied by all appropriate supporting documents, including a course description and – if requested – a course syllabus. Additional documentation may be requested at the discretion of the Chairperson. The Office of Admissions will notify the student of the decision via Labouré College email. *Students seeking transfer credit for a Labouré course in which they are currently registered must submit their request at least two weeks prior to the first day of class. To be awarded a Bachelor of Science in Nursing degree or an Associate in Science in Nursing degree, students must complete a minimum of 30 credits at Labouré College, regardless of the number of transfer credits awarded. To be awarded an Associate in Science in Radiation Therapy degree, students must complete a minimum of 43 credits at Labouré College, regardless of the number of transfer credits awarded. As long as college residency requirements are met, students may transfer up to seven (7) credits from other institutions after enrolling in the College. Students must request a Transfer Request Form from the Office of Admissions to ensure transfer course equivalency. The form must be completed with a copy of the course description and submitted to the Director of Admissions for approval. This process must be followed prior to the start of a student taking their desired course outside of Labouré College. Students cannot take courses at two institutions in the same term.